(Tech Xplore)—China is addressing its environmental future. 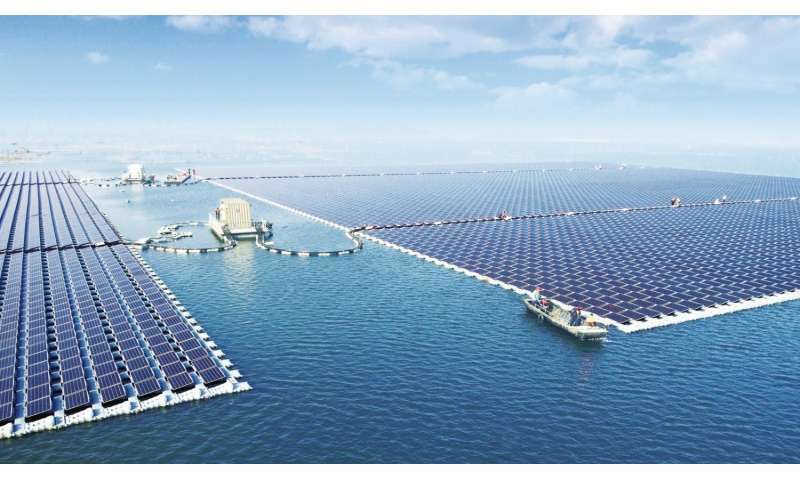 One sign is a floating solar farm power plant built on a former coal-mining area, and the floating power plant has been successfully connected to the grid, in Huainan. The announcement came from Sungrow earlier this month. According to designboom it can now start supplying solar energy to homes in the area. The Sungrow press release said that the power plant was based "in a subsided area of mining which is flooded due to the rainy weather with depth of water ranging from 4 to 10 meters in Huainan, a coal-rich city in south Anhui province." The release pointed out that "the seriously mineralized water makes this area valueless." The facility takes the title of the world's largest floating solar plant, said designboom, overtaking other floating farms in India and Australia. Sungrow is a Chinese photovoltaic inverter manufacturer. A number of sites carried a picture of the 40 MW-capacity facility. Sungrow's central inverter unit SG2500-MV was used in the project, as were its combiner boxes. What is this "inverter system"? It's the inverter, transformer and switchgear, as a turnkey station. Also, Sungrow noted the combiner box SunBox PVS-8M/16M-W, which was customized for floating power plants. The release noted stability in environments with high levels of humidity and salt spray. Sungrow works on research and development in solar inverters, and has a product portfolio of PV inverter systems as well as energy storage systems for various applications. "Renewable energy and clean tech are very big business in China and India right now," said Sami Grover in TreeHugger. Why put a solar farm out on the water? Cleantech Canada highlighted three key advantages of the floating farms. 1-Floating solar farms can reduce water evaporation and restrain the growth of algae. 2. Water can cool down modules and cables; improves the efficiency of power generation. 3. These farms have an advantage of not taking up valuable land. "The Huainan facility is part of Beijing's quest to transform China– one of the world's worst polluters– into a clean energy giant and a world leader in the fight against climate change." Actually, a report in Digital Trends said, "This is just the first of many solar energy operations popping up around China. In 2016, the country unveiled a similar 20MW floating facility in the same area. China is also home to the Longyangxia Dam Solar Park, a massive 10-square-mile, land-based facility touted as the largest solar power plant on earth." I'm wondering how feasible such farms would be off shore. E.g with a mechanism that would submerge them in inclement weather to a depth where stormy winds and wave action could not hurt them. Planetd in the middle of the ocaens at strategic points such farms could produce hydrogen - either as an energy carrier to be transported to land or a srefueling stations for hydrogen powered shipping. We can do this here in California. When the Monsanto boys finish with ruining Central California and its land subsides to salt water untrusion, rendering it of no value, then we can use this Chinese idea to make it produce electricity with no pollution. We first have to nationalize the land from the ruiners with no compensation to those we should also put to jail and throw away the key.